The Mayor’s Book Club has a reading list for the first half of next year that aims to blend fiction and non-fiction, commentary and fantasy – and move around the globe as well. But if you have book ideas for this international reading group to consider down the road, we’d like to hear them. The group meets from noon to 1 at the Main Library. Brown-bag lunches are welcome. Anyone can attend any session. “Balzac and the Little Chinese Seamstress” was a big hit with the Mayor’s Book Club – with its tale of two teenage boys sent to the Chinese countryside for re-education. Its story was a great picture of friendship – and the magic of story-telling. And it offered a vivid look at the social and political history of China. To compare this picture of China to the China of today… was amazing. Have you read it? Share your thoughts here. Since the next selection for the Mayor’s Book Club is a graphic novel, we thought a little bit of background would be of interest. The term “graphic novel” was coined by Will Eisner who is considered to be one of the most important creators in the realm of sequential art -- which essentially is what graphic novels are. Today the most prestigious award that can be won by a graphic novel the Eisner Award. Graphic novels are no longer simply comics about super-heroes and the battle over good and evil. Today they cover all the literary genres including comedy, tragedy, romance, mystery, thrillers, science fiction, horror, fantasy and realistic fiction. They have become a very powerful medium for storytelling and they are a great tool for reluctant readers, students learning English and those with reading challenges. They can also make historical events more accessible to people by having dramatic visuals accompanying the text. In recent years graphic novels have become a popular medium for autobiographical stories. Blankets, by Craig Thompson, is an example of a young man’s coming of age and this month’s selection Persepolis by Marjane Satrapi is a memoir of growing up in Iran during the Islamic Revolution. Many find the combination of image and text to be very powerful. Not only biographies, but social issues, health issues and powerful stories about loss are all addressed through this medium. One of the latest trends: adapting novels into the graphic format. “The Kite Runner” and Ayn Rand’s “Anthem” are two examples. Mayor's Book Club a Success! Fifty people came to the first lunchtime meeting of the Mayor’s Book Club at the Main Library – and at least a third of them shared their views about Cutting for Stone , a novel by Abraham Verghese, a book they generally liked… especially its vivid picture of life in Ethiopia and a doctor’s world. Put the next meeting on your calendar Octtober 19 and get ready to imagine life in the middle of a political revolution, from the experience of a child. 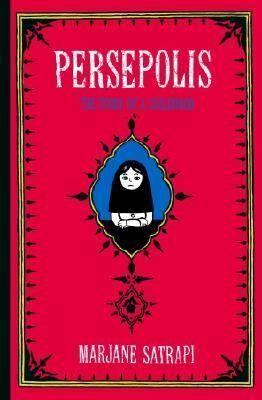 The next selection is Persepolis by Marjane Satrapi, who grew up in Iran. The format is black and white comic strips – a graphic novel. I think it's great to suggest other titles. It's nice to have some short books for busy people, too. Upcoming titles for the rest of 2013! Welcome to Read Your Way Around the World’s community conversation about books with roots around the world.